New Adult Paranormal Romance by bestselling author Kristie Cook ** Mature Content ** Recommended for ages 16+ due to sexual situations and languagePower, the next installment of the Soul Savers Series, takes you on a hot and edgy ride with twists and turns you'll never see coming, leaving you breathless and once again begging for more.As the stakes rise, can she find her tNew Adult Paranormal Romance by bestselling author Kristie Cook ** Mature Content ** Recommended for ages 16+ due to sexual situations and languagePower, the next installment of the Soul Savers Series, takes you on a hot and edgy ride with twists and turns you'll never see coming, leaving you breathless and once again begging for more.As the stakes rise, can she find her true power? As the Amadis prepare for war, Alexis returns to Florida with orders to relax, regenerate and replenish her depleted power. But her task list quickly grows--establish a new safe house, learn the art of conversion, find her AWOL protector, help a desperate fan, and protect her son. Oh, and figure out what's going on with her husband, whose peculiar behavior just might get them killed.But most important of all, her primary mission: recover her stolen pendant.The stone in the pendant not only promises hope for the Amadis future, but its unknown qualities make it a possible weapon in the wrong hands. With guidance and power from an improbable source and an unlikely ally by her side, Alexis sets out to retrieve the stone before the enemy discovers its potential for mass destruction. But when she finds herself in the Daemoni's lair fighting for her life, all hope seems lost. Will she discover the true power she holds in time? And is it enough to save herself, her family and the Amadis? can not wait for spring 2013 to come.wish i could flash myself there so i can read the next installment of this addicting series! just pop on overbut sadly thats not possible and Ill have to patiently wait like everyone elseoh welluntil then spring 2013. First off I'm still SO very glad that there is not a love triangle in this series. Thank YOU!!! I really really enjoy the issues that Tristan and Lexi have to go through, soul mates or not. Makes them normal to me I guess. I do get a little annoyed when Lexi still has "moral issues" with her powers but that might be me being jealous that I can't read peoples minds :) I wouldn't have an issue "spying". :) Anyway, like the stars say, I LOVE this series I cannot wait for the next book. YET AGAIN another Fantastic read from Kristie Cook. There were parts that were so heartwarming and sincere, as well as moments where I caught myself holding my breath in complete suspence. As the fourth installment to this series I found this book really amazing! I found it made me laugh out loud, tear up at times and even feel some resentment towards some of the characters.TERRIFFIC and i can't wait for spring 2013 for the newest and fifth book!!! I am a huge fan of the series, and this book did not disappoint! Non stop action from start to finish, and it kept you guessing. When you thought that you knew where the story was going, it would swing in a completely different direction. There were some revelations and I found myself rooting for someone that I never thought I would root for! I loved this book and I can't wait for the next one to come out! Kristine did it again!! I loved this book! The Vanessa situation was awesome! If I had to choose a down fall to these books is. (don't read if you don't want a spoiler) is how our fierce warrior Tristan is always needing to be "saved". However, the way it was done in this book was beautifully written in way that made me yearn to see what happened! You will be dying for book 5 after this one. She is leaving us with two cliffhangers!! 2!! Kristie, you did it AGAIN!!! Another THRILLING, SWOONWORTHY story! I had so many moments of heartbreak thinking/wondering what the heck our Owen was doing. I have no idea, but now I get what you said when you mentioned that Owen would have some hard times ahead. Poor guy! Send him my way for some much needed R&R :PFull review to follow soon. I love this series I couldn't put this book down at all. I loved the adventure and the way it made me sit at the edge of my seat wondering what is going to happen next. I can't wait till thefifth book confess out, I didn't like how it ended not fair. Its such an emotional rollercoaster and I love every minute of it! I enjoyed reading this book. 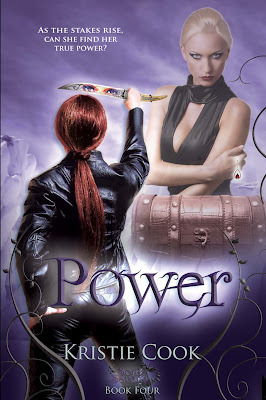 Took me a while, not because it wasnt quality, just because I have had lack of time A quality continuation from Power - the first Kristie Cook Soul Saver Series book She has converted me from an Obsessive Self Help book reader to a converted Story book reader!! This was a particularly fun addition to the soul saver series! I love the age old dilemma presented in this series, do you want to be good or evil? There is always a choice. A lot of surprises were revealed as well! I can't wait to see what happens in the next book! Loved it!!!!! Outstanding on the edge of my seat from the first page. Epic!!! OMG!!! What an endingat's all I'll say but how am I going to wait until next spring!?!? Cliffhanger?!? What?!? :)))) great read!! As always I'll be waiting for the next book in this series!!! I can't believe I waited so long to read this book. It was just as great as her other ones. I loved it! This series keeps getting better! Although there were some predictable spots, there are so many twists and turns. I can't wait for Book 5 to be released. Another book to love. This series is great, and I can't wait for the next one to be published. Highly recommended series of books. Brilliant as always. Full review to come.